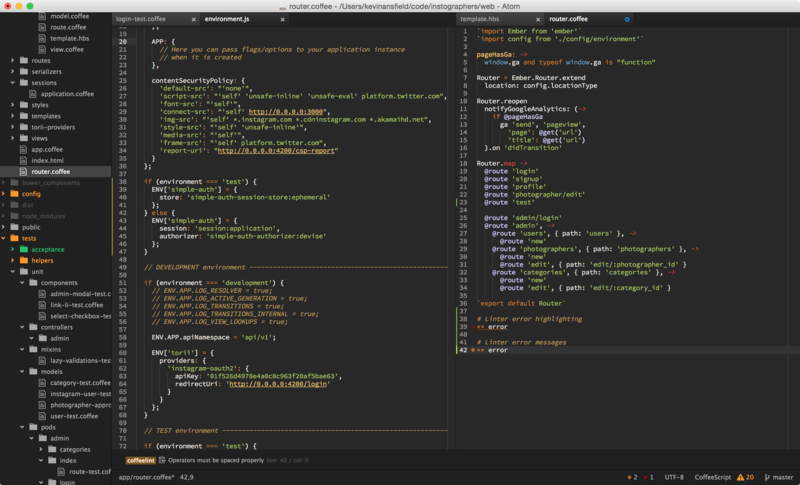 I switched from Sublime to Atom around 6 months ago and haven't looked back since. The level of customisation available and the flourishing community have convinced me to stay despite the occasional hic-ups with large files and it's slighly longer startup time. Linter - This provides an API for language-specific linters to hook into. It handles the error highlighting and pop-up messages when the current line has an error. Docblockr - A helper package for quickly writing documentation or just making multi-line comments easier to write. Fully language aware for auto-generating function/variable docs. Sort Lines - Sorts your lines alphabetically, can also remove duplicates. Simples! That is basically it apart from general language parsers. Please let me know if you have any suggestions for new packages or better replacements for the above!